From Tamashii Nations. 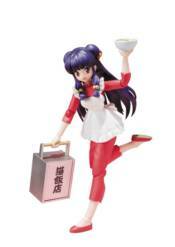 The second character to join the highly anticipated Ranma 1/2 articulated S.H.Figuarts series is the cute, yet feisty, Shampoo! The best part of this set besides the stunning Shampoo figure itself has to be the cat version of Shampoo. Or is it the ramen and carrying ('okamochi') box accessory? Or the variety of interchangeable facial expressions?? We'll let the fans decide. In total, set includes 3 interchangeable facial expressions, 6 interchangeable hands, 2 gripping hands, neck support piece, ramen, carrying ('okamochi') box, cat version Shampoo, and stand.